Our instructor-led video based training for AutoCAD LT 2013 consists of over 485 separate lessons covering more than 30 hours of training. This comprehensive includes all the tricks and tips you will need in order to work effectively with this latest AutoCAD LT software release. Each video-based lesson is designed to allow new users of the ACAD LT 2013 software to quickly become familiar with the program's interface, coordinate system, entry methods, and basic display features. Experienced users will discover detailed examples of drawing geometry with the various time-saving drawing commands. 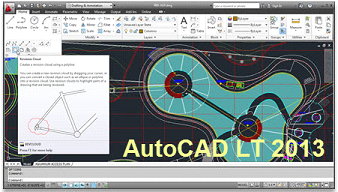 You will learn the features and functions of AutoCAD LT 2013 to create and edit 2D drawings and designs. The step-by-step training approach provides hours of lessons detailing and exercise files. The course demonstrates a variety of concepts beginning with an overview of getting started, drawing basics, utility and inquiry tools, modifying objects, customizing the user interface as well as collaborating with others using AutoDesk 360.